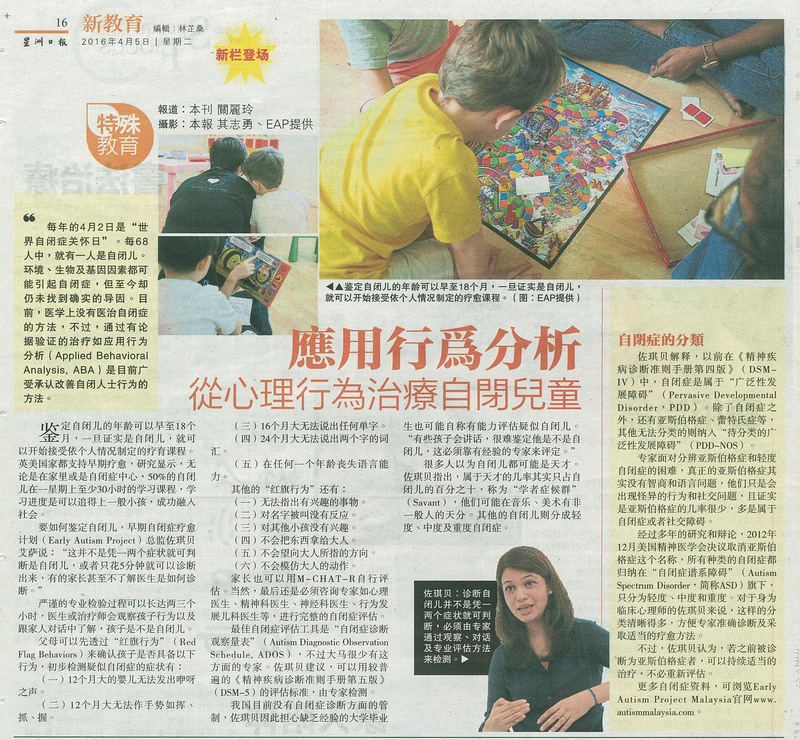 On the 5th of April, our director, Jochebed Isaacs, was featured in the Sin Chew Newspaper, speaking about an introduction to autism. successful outcomes in treating children with autism. hours per week in a centre or home setting. The director of Early Autism Project (EAP) Malaysia, Jochebed Isaacs, says, “The display of one or two symptoms of autism, or a 5-minute interview by a doctor is not enough to give a diagnosis of autism for your child. In fact, most parents do not understand the diagnosis evaluation given. to a clinical psychologist, psychiatrist, neurologist or developmental paediatrician to receive a more thorough assessment for autism. (DSM-5) as the golden standard for diagnosis. not least, autism is a spectrum disorder, which means people are mildly, moderately or severely affected. otherwise specified (PDD-NOS) and childhood disintegrative disorder. time, they were diagnosed autism or social phobia instead. helpful for the accurate diagnosis and intervention. with the treatment without further diagnosis. the official site of Early Autism Project, Malaysia, www.autismmalaysia.com.